A Frank Beamer personal appearance, Frank Beamer speaking engagement, or Frank Beamer endorsement will reflect well on your company. To hire Frank Beamer now for any corporate appearance, fundraiser, motivational speaker event, personal appearance, autograph signing, or website endorsement please contact our celebrity agents at 1-877-6-SPORTS. We will contact Frank Beamer or contact Frank Beamer's agent and provide you with the booking fees and availability immediately upon your request. Direct Sportslink is the only sports speakers bureau and talent booking agency based in the United States securing only sports talent for corporations, associations, and organizations for motivational speaking engagements, personal appearances, and endorsements. We are the premier sports celebrity booking agency and a sports celebrity procurement expert. Accordingly, we will provide you with any relevant Frank Beamer website information and booking agent details so that you can hire Frank Beamer for your next event. Beamer attended Virginia Tech and was a starting cornerback for 3 years on the football team, playing in the 1966 and 1968 Liberty Bowls. He graduated in 1969 and then attended Radford University for graduate school while serving as an assistant football coach at Radford High School. 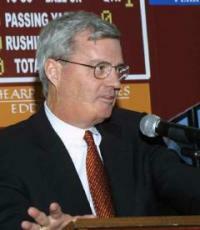 After several coaching stints, Beamer was hired as Head Coach at Virginia Tech in 1987. Beamer took over the Hokies football program that was largely unsuccessful in its first century without him as Head Coach, reaching only six bowl games in that time span. Beamer built the Hokies into a perennially ranked team. 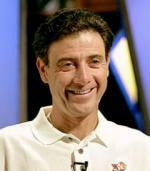 He won Big East Coach of the Year awards in 1995, 1996, and 1999. In 1999, he won consensus National Coach of the Year honors when he led Virginia Tech to an undefeated regular season and appearance in the National Championship game against Florida State. 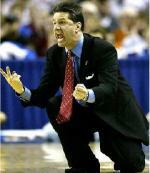 Beamer was named the Atlantic Coast Conference Coach of the Year in 2004, his first year competing in the league. He repeated as ACC Coach of the Year in 2005 while leading his team to the ACC Coastal Division title and an appearance in the inaugural ACC Championship game where they lost to Florida State by a score of 25-22. In 2012, Beamer was the winningest active NCAA Division 1 coach. Based on your interest in Frank Beamer as a speaker or for a personal appearance, Direct Sportslink has provided you additional links below for other sports talent with similar appearance fees, speaker topics, and categories that match Frank Beamer.